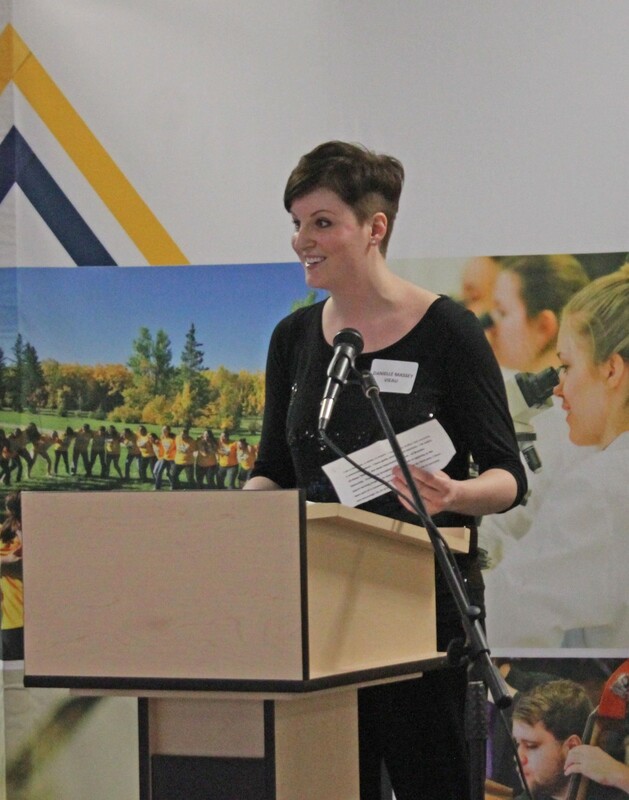 Bursary recipient Danielle Vieau speaks at the Brandon University Awards Reception on Wednesday, March 23 at Harvest Hall. BRANDON, Man. – Brandon University’s (BU) outstanding students and the generous donors that help them reach their goals were celebrated on Wednesday night at the annual BU Awards Reception. In the 2015-16 academic year BU offered 589 scholarships and bursaries, many of which provide funding for multiple students. This has resulted in $1.4 million in assistance for students over the course of the academic year. In 2015, enrolment levels were up five per cent from the previous year, and scholarships support the attractiveness and affordability of education at BU. Linda Jameson, the mother of scholarship recipient Alexis Jameson, thanked the donors in an emotional speech. Award recipients signed large whiteboards with messages of thanks for the donors. Following the formal portion of the event, a number of students were introduced to the donors that contributed to their education. Other speakers at the reception included Ramjit Mann, who helped to establish the Guru Nanak Dev Scholarship last year on behalf of Brandon’s Sikh community, and bursary recipient Danielle Vieau. Vieau said in her speech that she has felt a connection to the donors throughout her time at BU.